As many of you know, Ratchet and Clank Movie director Kevin Munroe had been posting deleted scenes on instagram for a while. Well now you can watch almost all of them in this video! There are French subtitles, but the video is in English without sound effects. Also, some of the scenes have unfinished animation. Let's take an inside look to each scene. 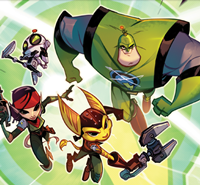 The first scene takes place after Ratchet tells Grimroth, "I should've dreamed smaller…" Ratchet heads to his room and listens to a Captain Qwark button that keeps telling Ratchet he can't be a galactic ranger. Devastated, Ratchet throws it away, and his bed flings upwards. The next scene shows Ollie, the OTHER Qwark Fan-boy, waiting outside the Hall of Heroes. He keeps saying "Ranger" while the Qwark statue says "Asteroid." Nothing else to this scene, but it does explain why Ollie appeared outside the Capitol when Qwark and the Rangers saw him. The next scene is an extended action fight, between the Rangers and the Warbots. Clank fixes Ratchet's targeting matrix, which helps him fire at the warship. But the warship returns fire, causing them to "improvise." Why is my news article copied to this thread? I think he might be a spammer, so I'll keep an eye on him for any more posts like this. In fact, this whole thread appears to be spam, since the original post is a promotion for a game and contains other spam links.